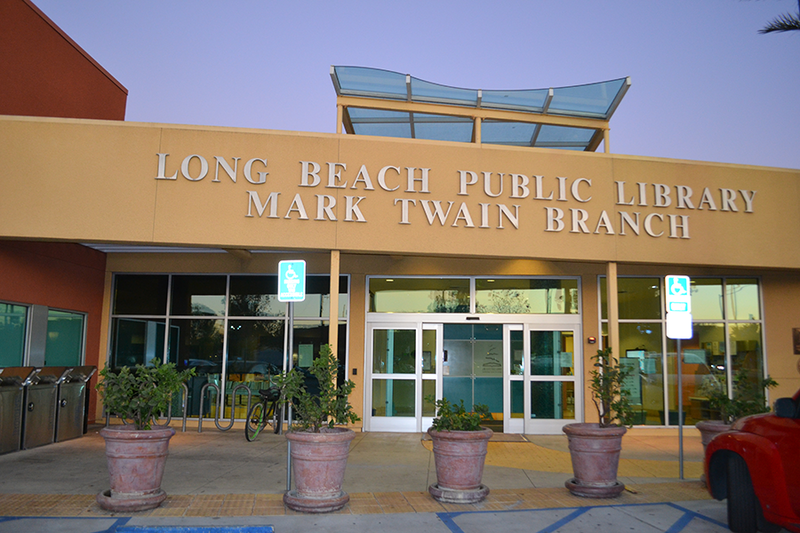 The Mark Twain Public Library in Long Beach. Photo by Stephanie Rivera. Leaning against his walking cane, Fernando Miramontes waited in line at the help desk inside the Mark Twain Neighborhood Library in central Long Beach hoping for an extension. It wasn’t for a book that he was hoping to finish before returning it to the library’s collection; he sought something a little more rare—and valuable—for a man without a home internet connection: more time to the surf the web. Miramontes said he had heard that Section 8 vouchers would be made available again in Los Angeles and wanted to ensure that he threw his name into the proverbial hat. Section 8 applications, like so much else these days, have gone online. He acknowledged that if he’d had an internet connection at home, he would’ve applied sooner—and wouldn’t have had to worry about time constraints on the public computer. As it is, he spent so much time just trying to find the right website that he ran out of time and had to request an extension. “I’m in the learning process,” the 47-year-old Miramontes said. Of the roughly 62 percent of minorities living in the city, Miramontes is one of many who reside heavily in the north, central or southern areas of Long Beach, which report the highest rates of poverty and lowest rates of home internet access. Many rely on public computers to find better jobs or complete school work—tasks that research shows can ultimately lead to less dependency on government aid as workers find better job offers or complete education or training that can ultimately lead to better wages. While internet use is reportedly going up, the gaps in internet adoption rates are growing, according to Hernan Galperin, an associate research professor at the University of Southern California who specializes in information and communication. Galperin recently published a series of policy briefs on the digital divide which looked into how lack of internet access contributed to the poverty cycle. While black and Hispanic households countywide fell up to 15 percent behind white households in having internet connection, those rates dipped further when looking at having broadband and a PC as well as high speed internet at home. Blacks, at about 58 percent, and Hispanics, at about 60 percent, paced behind white households by about 20 percent. While the brief examined the county as a whole, Galperin submitted Long Beach-specific data to the Long Beach Media Collaborative to demonstrate how these trends were specifically affecting the city. At about 77 percent each, Long Beach and LA County both had similar adoption rates but when broken down by the city’s regions the disparities become clearer. East Long Beach, an area of the city with the highest concentrations of both wealth and white households, showed an internet adoption rate of over 88 percent. However, rates lagged behind in North Long Beach at 76 percent and in Southwest Long Beach at 67 percent, areas with a larger minority population. In an interview, Galperin did note that the rate captured for one of Long Beach’s poorest areas, Central Long Beach (78.1 percent) did include data collected from comparatively more affluent Signal Hill, which likely skewed the rate upward. Racial demographics of north, central and southwest zip codes of Long Beach using estimates from the 2015 American Community Survey. Poverty rates for Long Beach’s north, central and southwest zip codes using estimates from the 2015 American Community Survey. There are negative impacts when not having a home connection, or having a connection but no computer which forces a growing number of people to use their smartphones as a portal to the internet once schools and public libraries close. It takes longer to complete job applications, opens people up to cyber-security issues, or outright makes it impossible to complete the tasks they set out to do. And in an era when politics are being pushed online it can become increasingly difficult to be informed or involved in decisions that will ultimately affect those negatively impacted by the digital divide. Carmen Tellez, whose three children attend Jenny Oropeza Elementary and Marshall Academy, has never had the internet. As a single mother the 37-year-old simply cannot afford it, so she too spends multiple days a week at the city’s libraries so her kids can have the access they need to excel in school. Tellez, who primarily speaks Spanish, uses the time trying to play catch up so she can better communicate with her children. “In this case now, I was on the internet to find English and computer classes to be able to communicate with my children and be at their level because every day technology is evolving more and more and as a parent one can get stagnant,” Tellez said in Spanish. Susie Perdomo, a 44-year-old single mother of two, has to take her 9-year-old son to the library multiple times a week to complete mandatory math exercises that can only be completed online. The “JiJi” program requires both internet and a computer, the latter of which Perdomo lacks. She said she previously had internet at home when she was able to split the cost with a roommate, but when the roommate moved out she cancelled the service because she did not want to make the $60 monthly payment on her own. Cost is certainly a factor when it comes to whether or not a household will maintain an internet connection at home. But Cal State Long Beach journalism professor Gwen Shaffer said that most of the time people do not choose to opt out of having the internet, they’re priced out. Even with access, the knowledge and ability to effectively use the internet is a major component of closing the digital divide. In a 2013 entry in the Journal of Information Policy, Shaffer and co-authors Amy Bach, then a lecturer in the Urban Studies Program at the University of Pennsylvania, and Todd Wolfson, then an assistant professor in Rutgers University’s Department of Journalism, argued that basic training programs need to accompany access to technology. They pushed for training programs to teach the technologically disadvantaged how to better utilize the internet, which could help when racing against allotted reservation times at libraries, but also use the internet meaningfully for economic advancement, the kind of result that could boost their earnings to the point that they could afford a home internet connection. Shaffer said the digital divide puts these people in both economic and social disadvantages. Without access to the internet—she stipulates that public libraries are vital, but do not serve as a replacement for being wired at home—these people often miss out on opportunities to become more educated and upwardly mobile. It also eats away at opportunities that many may take for granted. In the Facebook and Twitter age, communicating with family members or friends who live far away or are simply too busy to see in person, has become much easier. Emailing a mayor or council member to file a grievance of something happening in your neighborhood is just a click away. But not for those without access. For those like Miramontes, these opportunities are constrained to hours and days that the city’s libraries are open, or when they can acquire a free wifi signal. With three failed back surgeries and no prospects of ever recovering from the injury that struck him some six years ago, Miramontes is unlikely to ever afford a home internet connection. But that hasn’t stopped his son, Fernando Jr. from excelling in school. He participates in the school’s Gifted & Talented Education (G.A.T.E.) program and often helps other students understand class work. However, it often comes at a cost as he’s forced to forego recess so he can complete classwork that would otherwise go unfinished because it requires a computer and internet access. Miramontes says the problems his family faces are endemic, with countless others in his neighborhood who are either too poor to afford the internet or come from countries where they do not see the value in it. He knows the lack of home access is affecting his children but he holds hopes that his son will be able to earn his way into a college education.